It’s just been confirmed that this is a TOTAL LIE. BAAQMD has just quietly permitted Phillips 66 a 24,000 barrels-per-day expansion of its “hydro-cracking” facility, which is the equivalent of 2.3-3 times as much crude processing potential. This facility is used to break down the heavier components of dirtier crudes—such as tar sands—into lighter, usable fuels like gasoline. This amount of cracking would support an increase in total refinery capacity of 65-88,000 barrels per day. The expansion of the cracking facility confirms that the real purpose of the wharf expansion is to ship in heavier crude oil stocks. It confirms what Bay Area environmental groups have been saying—that it’s a tar sands project, and as such is a clear and present danger to the health of Bay Area frontline communities, and a barrier to any chance for us to meet California’s climate change goals. The processing of these heavier crudes results in higher emissions of particulate matter and associated toxic metals. The health impacts are dire: these increased emissions will drastically increase deaths by air pollution over the facility lifetime. And the extra energy required for processing these crudes will produce higher greenhouse gas emissions. For our communities and our planet, this is very bad news all around. Yet again, as in BAAQMD’s covert permitting of Kinder Morgan in 2014 to transport fracked crude by rail to local refineries, this project was permitted with NO public notification or comment. After the exposure of the Kinder Morgan project, and a legal challenge, BAAQMD staff promised their Board of Directors and the public that they would never again hide refinery expansion projects from the public. It hasn’t taken them very long to break that promise. -Expanded oil infrastructure will last for 30 to 50 years, at a time when we need to be phasing it out to save the planet. -Increasing production and switching to dirtier crude will impact refinery communities with increased pollution. -The wharf expansion will increase risks for minor or catastrophic spills in the bay. -The staff’s preemptive approval of the permit may provide an easier path for P66 to win approval for the wharf expansion. -The District initially denied there was an expansion of refining capacity associated with the wharf expansion, even while secretly working to approve it, in an undisclosed process, without public comment. -This looks like regulatory capture—bad faith, coverup and collusion by BAAQMD staff. -BAAQMD’s need for revenue from permits seems to be at odds with its mission to protect community health. And please try to attend the next meeting of the Stationary Source committee, which regulates refinery projects. Be prepared to make our absolute rejection of this project heard loud and clear at this meeting. Watch this space for further updates, talking points and other notices. 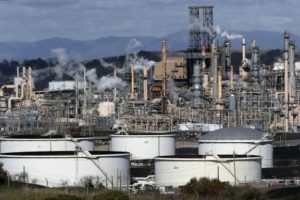 Stopping this refinery expansion project is essential to keeping tar sands out of Bay Area refineries!